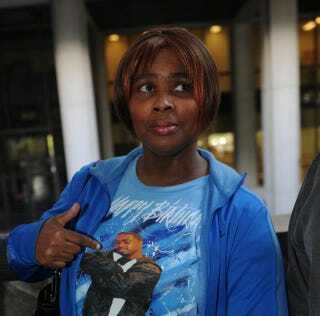 Wanda Johnson, the mother of Oscar Grant, points to his picture as she leaves a March 26, 2010, pretrial hearing at the Criminal Courts Building in Los Angeles for Johannes Mehserle, the former Bay Area Rapid Transit officer charged with murder in Grant’s 2009 shooting death. Friends who were with Oscar Grant the night he was fatally shot by a Bay Area Rapid Transit police officer have settled with the transit agency, the Associated Press reports. The five men—Jack Bryson Jr., Nigel Bryson, Michael Greer, Carlos Reyes and Fernando Anicete Jr.—will divvy up $175,000 among them as part of the settlement of a federal lawsuit reached last month. The men had originally filed a civil rights lawsuit for $1.5 million after the 2009 New Year’s Day detainment that left their friend Grant dead. The suit alleged use of excessive force and illegal detainment. "This closes a very traumatic and tragic chapter for these young men," their lawyer, John Burris, told the AP. "Unfortunately, they will never get over witnessing their friend's death." Just last year the story of Grant's last few hours on earth was broadcast to the world in the independent movie Fruitvale Station. Michael B. Jordan played Grant. Grant's closer family members—including his mother and young daughter—also settled their case with BART for a total of $2.8 million, the AP notes.